Stage set for My Avisia Winger, 2004. Way back in the day, a group of longtime friends returned home from college and decided, “Hey, kids, let’s put on a show!” When the Hunt family generously agreed to host the group in the Historic Schmeiser Barn in the countryside of Yolo County, Barnyard Theatre was born. 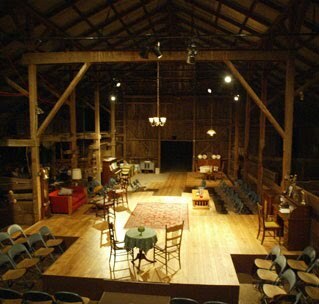 Each summer since 2004, undaunted by dust and mosquitoes, the company has transformed the working barn into an working theatre. Audience members enjoy seeing a wide variety of original works in this unique theatrical venue. Find out more about the board, or how to contact us.